Bread is a misunderstood food to me. Not because of the carb-no carb debate that still rages on (for the record I could not live in a world without carbs but do try to balance that with more veggies) but because there is a myth that in order to make homemade bread, one needs to have years of experience and be a trained baker to do so. Bread is not hard. Bread takes time, bread takes effort and bread can be picky about temperature but bread is NOT hard. If you are truly afraid of making bread, I would recommend that you check my archives and give my Basic French Bread a go before reading on because the bread I am going to make today looks SO hard but really is not. But this bread is a time commitment, which is why I named it Cold Day Bread. Do not make this bread when you have 1,000 things to do and no time to do them all, you will just ruin it and turn yourself against homemade bread. This is a perfect bread to make on a cold day when going anywhere or even putting on pants is just too much and the biggest accomplishment will be a book or a Nexflix binge. Why not reward yourself with some amazing bakery quality bread for all that no real pants wearing you did today? A word on this recipe: I pride myself on providing recipes that home cooks can turn out without tons of hoops, rare ingredients and gadgets galore, but for this recipe to really work you need one item. You need a Dutch oven with a lid or a similar large oven friendly pot. You need this to give the bread the right environment to bake with an amazing crust, a magical crackle and a taste you will be amazed came out of your kitchen. In addition, I also recommend (but do not require) having a kitchen scale as I will be providing ingredient measurements by weight. I have found that this turns out the most consistently delicious bread. I will also provide measurements in cups and tablespoons which will be as close to their weight counterparts as I can get. The bread will still be amazing I swear! 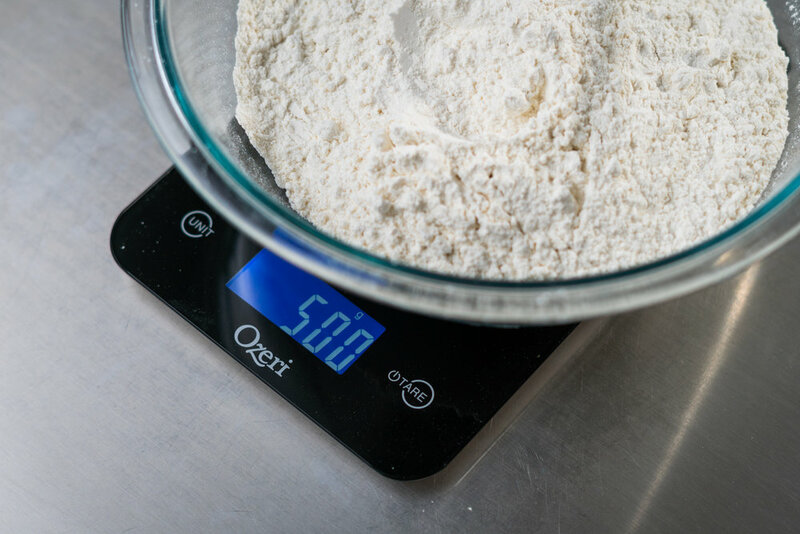 If you do decide to ever make this bread again by weighing the ingredients, I think you will notice the little bit of extra having perfect measured ingredients brings to the table. And I promise this is one of the few recipes where I will get all crazy about precision! Now let’s make some bread! Before you slice, make sure you listen. You will hear a distinct crackle from your bread as it cools down. This sound is so cool and lets you know that bread is just about ready. Now slice and enjoy a little bit of bread heaven! I will generally microwave the water for about 1minute 15 seconds to obtain the ideal temperature for the bread and will test the temp with a kitchen thermometer. If you do not have a thermometer, the water should be very warm to the touch but not burn. If it burns, it’s too hot and will kill your yeast. Don’t do that! The one downside to Cold Day Bread is that making it on a cold day can be a challenge from a rising standpoint. The bread will not go if your house is too cold so I recommend either finding a warm and sunny spot in your house that can let it rise in or try this trick I’ve learned. Preheat the oven to 350, but only allow the oven to be on for maybe 3-4 minutes. Wait about 2-3 minutes, then place your bowl of dough in the oven and allow it rise there. The few minutes of heating allow the oven to warm up a bit and most ovens hold heat pretty well. Since this has a pretty long rise time, make sure you check in on the oven from time to time and if it gets too cold, preheat the oven again at 350 for 3-4 minutes and keep the oven door ajar so it gets some heat but not too much.